After a solid yet unspectacular career on the slopes Frenchman Julien Lizeroux suddenly broke into the spotlight at 29-years-old, meaning that along with his friend Jean-Baptiste Grange France has two major medal hopes. In two months the man from the resort of La Plagne in the French Alps, who had never before made the podium, hit the headlines with two silver medals at the 2009 world championships at Val d'Isere and picked up his first two World Cup victories. 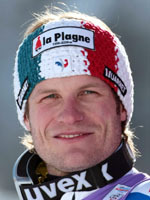 His best season to date culminated with third spot in the slalom rankings behind Grange and Croatian Ivica Kostelic, who took second. The diminutive yet compact Frenchman (1.73m/78kg) had previously been amongst the top ten but never on the podium until a win in the prestigious slalom race at Kitzbuhel, where Grange was second, turned his career around. With the Vancouver Games fast approaching, a pair of world silvers has turned Lizeroux into a serious gold medal candidate. He won his second World Cup race at Kranjska Gora, and was then runner-up at Aare during the final slalom race of a season he didn't want to end. Now nearly 30 he has established a reputation as one of the best battlers on the slopes and has also channelled his technique into winning results. "The key is that I've found a balance between my committment, my physical capabilities and my technique. I'm calmer, I don't force my skiing, I economise, make fewer mistakes and skiing faster," he explained. Until his win at Kitzbuhel, this son of a mountain guide father and ski instructor mum was in the shadows of Grange. The previous season he finished in the top ten during ten of the eleven slalom races on the World Cup circuit. However, it is podiums and victories that count and he can now enjoy that status as well. His career has also been hit by injuries and five years in the wilderness of the European Cup circuit. But that was nothing compared to the pain of his brother's death at 32 in 2008 when a parachuting trip turned to trajedy in Switzerland. Lizeroux is now preparing for what will be his first appearance at the Olympics when the Alpine skiing takes centre stage at the Whistler resort just outside of Vancouver and where the Frenchman will be a medal contender in both the slalom and super-combined.